Page 3: Hydraulic jacks and Millennium MO series hydraulic jacks. Page 4: Millex & Millennium M series hydraulic jacks, Trolley jacks and Tipper Jacks. The S414 is a 15 cwt twin screw jack. Cast with S414 LAKE & ELLIOT on the drive side. On the opposite side is PAT NO 235497 15 CWT. It measures 5.25" closed and has a 5 7/8" screw extension. Extended height is 11.25". The base measures 3" x 4.75". Photos courtesy Mr Clayton. Not Known. Vendor thought it may be for a 1936 Riley 9. The patent No. 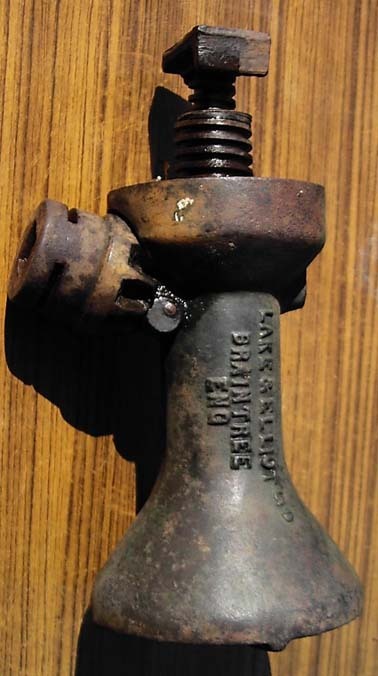 235497 was registered 9 February 1925, making this jack post that date. This version of the S414 above is slightly shorter, measuring 4 5/8" in height to the top of the casting (1/8" shorter). The jack above is shown on the left in the other photos. 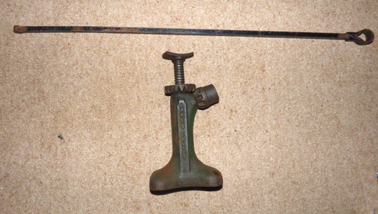 It can also be seen that the jack in this entry has a more rectangular base, measuring 3" x 4.75". Markings: to the left of the winder – at the rim, ‘PAT No 235497’, below, vertically ‘L&E’ – to the right of the winder – at the rim ‘15 CWT’, below, vertically, ‘S 414’. Photos and data courtesy of NewMoody - good man to spot these subtle differences! The S416 is a 1 ton triple screw jack. 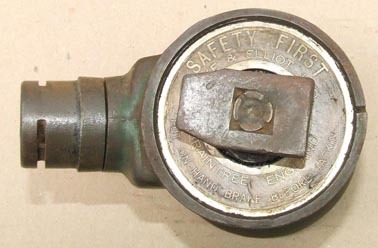 Cast with L & E LTD 51N on one side and S416. 1 TON on the other. It measures 5.15" and has an 8.75" screw extension. Extended height is 13 7/8". Photos courtesy of Malcolm Rose. 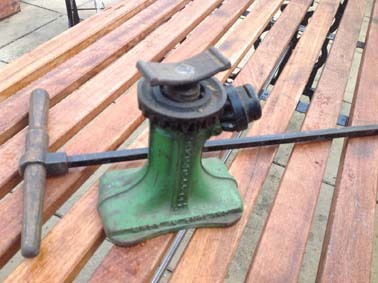 Information about the Jowett Jupiter and its handle courtesy Andrew Henshall in Australia. Morgan Plus 4 (circa 1951) - Courtesy Brendan Boyle. 36" 2 piece square section bar with a wooden handle. 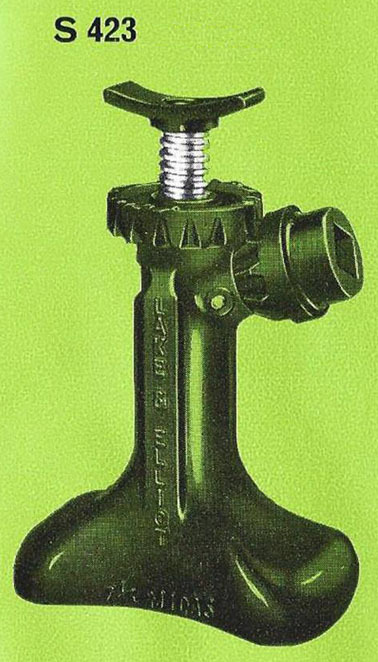 The TLP is a 1 ton triple screw jack, very similar to the S416 above. 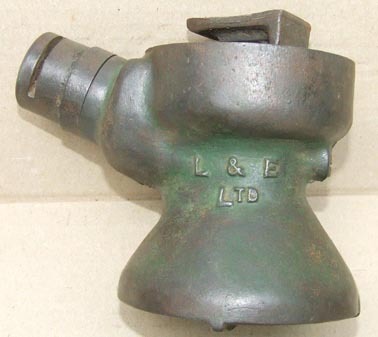 Cast with L & E LTD on one side and TLP 5 1/2 on the other. It measure 5.5" closed and 16.25" extended. Photos and information courtesy of Michael Tolomei. The Midas Junior 7 (S421) is the lighter edition of the 'Midas'. 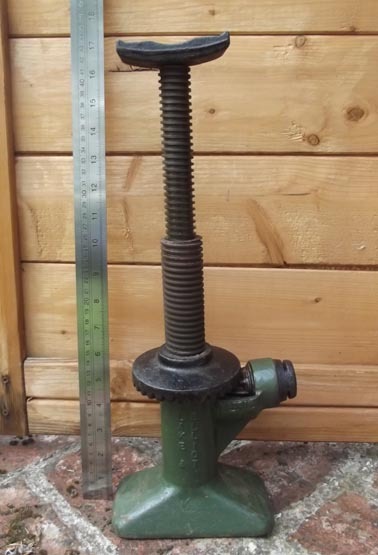 It is a 7.5 cwt single screw jack. Cast with LAKE & ELLIOT MIDAS S421. It measures 7.25" closed with a 4 3/8" screw lift giving an extended height of 11 5/8". 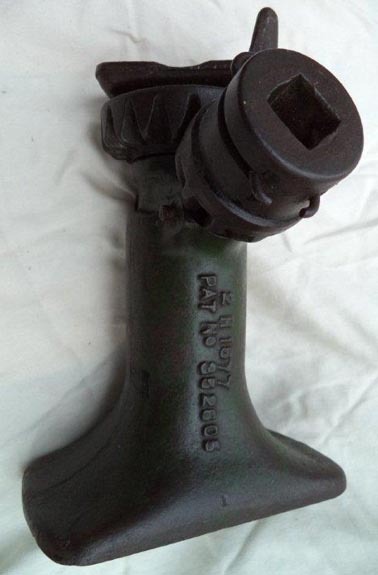 Ebay vendor in May 2017 reported that this jack is for the Austin 7 with a high frame chassis - 1923 to 1934. 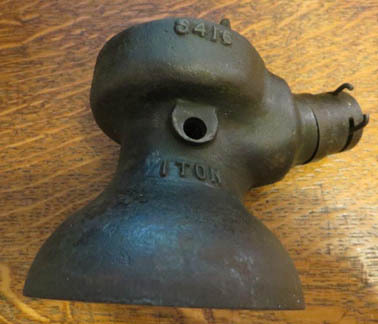 Tony Press also reports that for the Austin 7 the jack handle was almost certainly a single square section with wooden handle through a loop end. 24" long. The Midas JRS421 is a 7.5 cwt single screw jack. Cast with LAKE & ELLIOT MIDAS JRS421. It measures 7.25" closed with a 4 3/8" screw lift giving an extended height of 11 5/8". I believe the JR stands for Junior. One difference to the S421 above appears to be that the winder does not have a shoulder. The JRS575 shares the same design body casting. 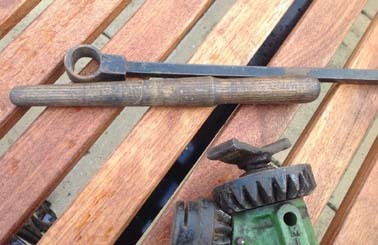 Tony Press from Melbourne, Australia reports that from notes he has collected on Austin 7 tools he believe that the 1920/1930 kit included either a Shelley (possibly the 7" Bantam) or the LAKE & ELLIOT Midas JRS421 jack. 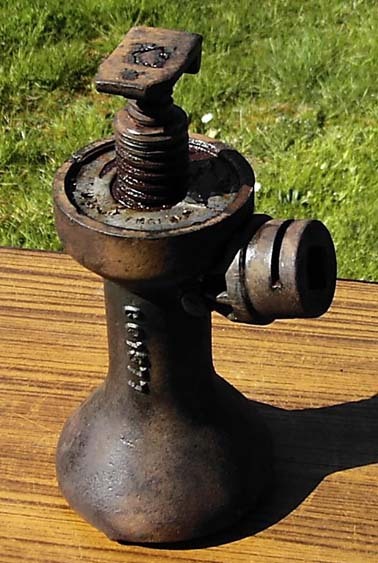 See also the Shelley 10DL for another Austin 7 jack. 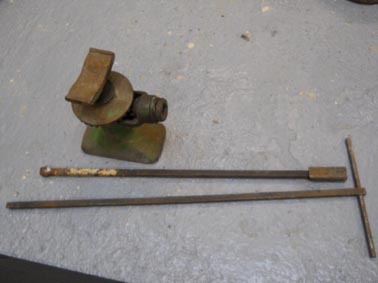 Tony Press also reports that for the Austin 7 the jack handle was almost certainly a single square section 0.5" x 0'5" with wooden handle through a loop end. 24" long as shown in final photo. 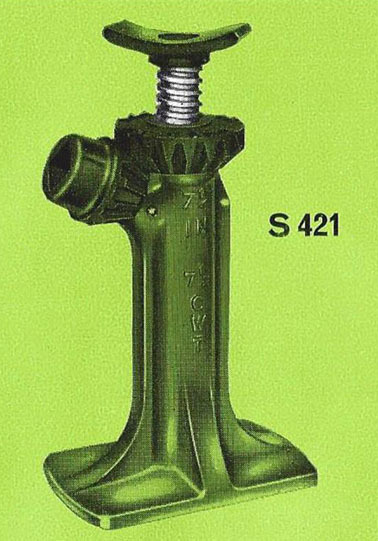 The S423 is a 15 cwt single screw jack. Cast with LAKE & ELLIOT 7 1/4 MIDAS PAT. 184723 on one side and S423 15 CWT on the other. Other castings are also shown in the 2nd and 3rd photos. It measures 7.25" closed and has a 4.5" screw extension. Extended height is 11.75". It shares the same body casting design as the S584. May have been supplied with the Morris Minor. Confirmation required. 30" long, see last photo. The S435 is a 4 ton cwt triple screw jack. Cast with LAKE & ELLIOT LTD NO. 314121. 4 TON S435. It measures 6.75" closed and an 11 5/8" screw lift. Extended height is 21 3/8"with a 3" swing top. Very similar to the S216. Daimler Armoured Cars WW2 era. See last photo courtesy of Danny Burt which shows either this jack or the S216 on the rear right wing. One part handle is 42"; two part handle is 84". Only details as shown in the photos. 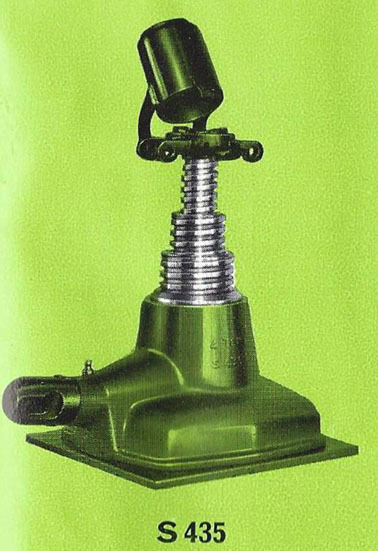 The Midas S575 is a 7.5 cwt single screw jack. Cast with LAKE & ELLIOT MIDAS S575. It measures 8.25" closed and has a 5 3/8" screw lift giving an extended height of 13 5/8". Handle hole is 3/4" square. It shares the same body casting design as the S421. 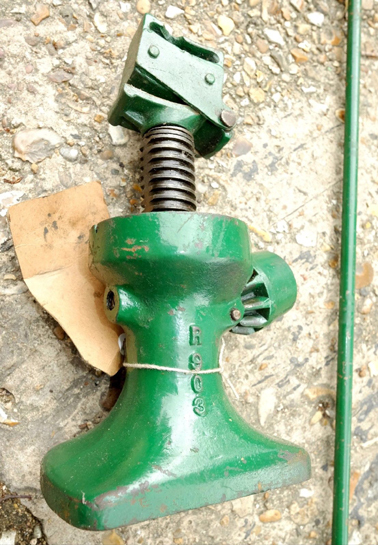 The Midas JRS575 is a 7.5 cwt single screw jack. 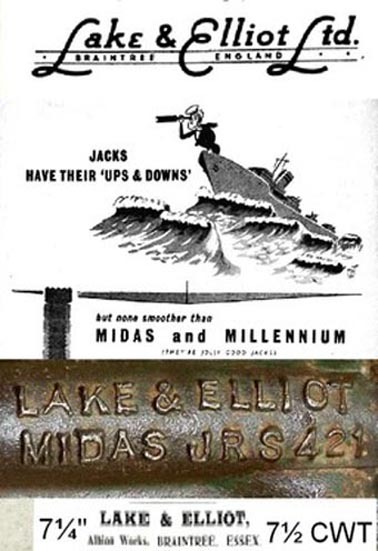 Cast with LAKE & ELLIOT MIDAS JRS575. It measures 8.25" closed and has a 5 3/8" screw lift giving an extended height of 13 5/8". Handle hole is 3/4" square. It shares the same body casting design as the JRS421. One difference to the S575 above appears to be that the winder does not have a shoulder. 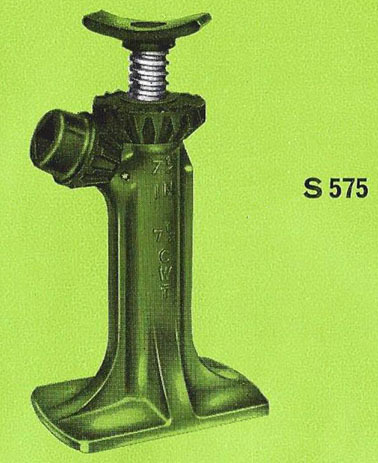 The S584 is a 15 cwt single screw jack. It measures 8.25" closed and has a 5.5" screw extension. Extended height is 13.75". Socket drive is 1/2" square. It shares the same body design as the S423. 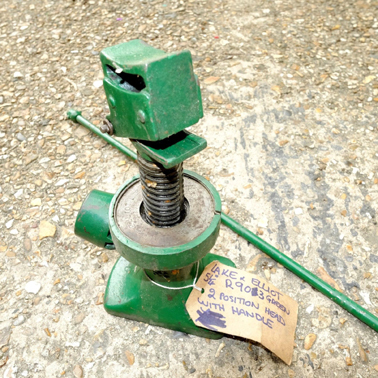 The JRS635 is an alloy bodied 7.5 cwt single screw jack with a hinged extension. It measures 7.25" closed and has a 4.75" screw extension. It is cast LAKE & ELLIOT MIDAS JRS635 on one side and 7 1/4 IN 7 1/2 CWT on the other. The S655 is a 2 ton double screw jack. Cast with LAKE & ELLIOT LTD 2 TONS on one side. On the other is S655 on the shoulder lug. It is 6 7/8" closed and has a 13.75" lift. Extended height is 20 1/8". First 4 photos courtesy of Paul Richen. 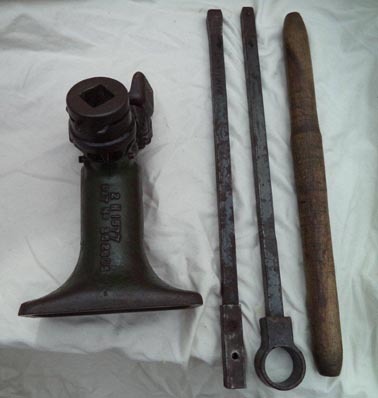 The final 3 photos show the jack extended and with the handle. The jacking point appears to differ from the first jack example. Possibly Humber Limousines in the 1940s. Clarification required. 36" length. See final photo. 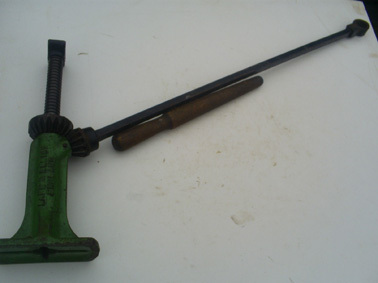 The P706 is a light double screw jack. It is 7.25" closed; and 16" extended. The base measures 3" x 3.75". Unusually the drive hole is circular with 2 cut-outs to accommodate pegs on the handle shaft. 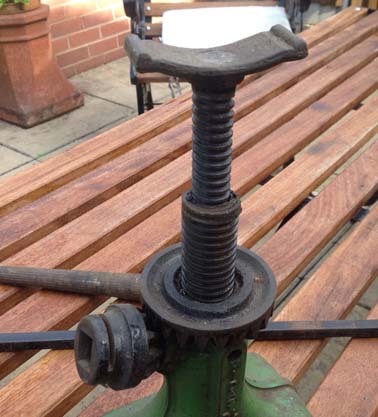 It is cast MADE IN ENGLAND around the top of the winder. BRITISH MADE vertically down one side of the body and L&E P706 down the other. 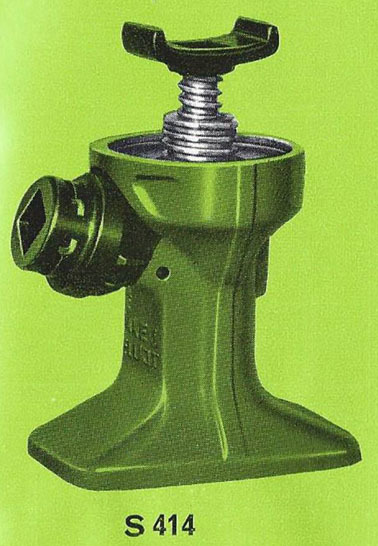 The P706R is a light double screw jack. It is 6" closed; 9" extended on winder and 13" with the inner screw manually extended. The base measures 3" x 3.75". Unusually the drive hole is circular with 2 cut-outs to accommodate pegs on the handle shaft. Photos and Information courtesy of John Hawking from Australia. 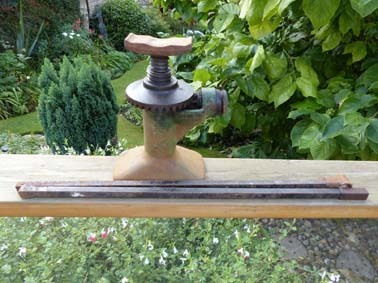 The third photo is another version showing slots on the winder. 30" as shown in last photo. The P706T would appear to vary from the P706R above with the shape of the saddle. 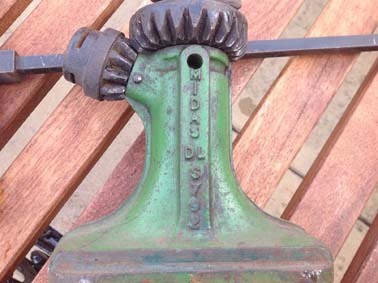 It is a light double screw jack. It is 6" closed; 9" extended on winder and 13" with the inner screw manually extended. The base measures 3" x 3.75". 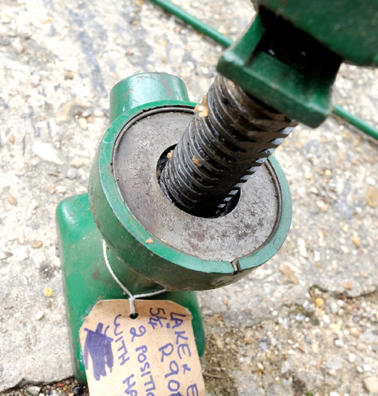 Unusually the drive hole is ovoid with 2 cut-outs to accommodate pegs on the handle shaft. Photos and Information courtesy of John Hawking from Australia. As shown in final 3 photos. Starter handle may also work. This is a double lift jack that measures 5.75 closed and 13.5" extended. It is cast P718S on one side and LAKE& ELLIOT BRAINTREE EN3. 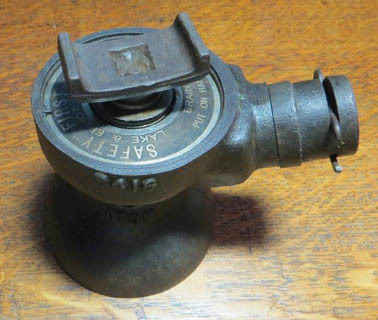 Photos Courtesy of George Radion in Australia who also informs me that the yoke appears to be non standard with signs of brazing to hold in place. 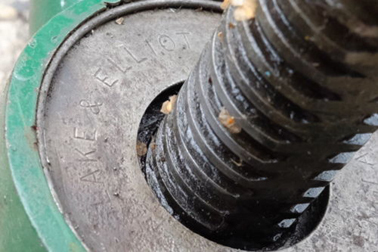 The P780 is a double screw jack. It is cast P780 PAT No. 184723. It is 7.5" lowered. 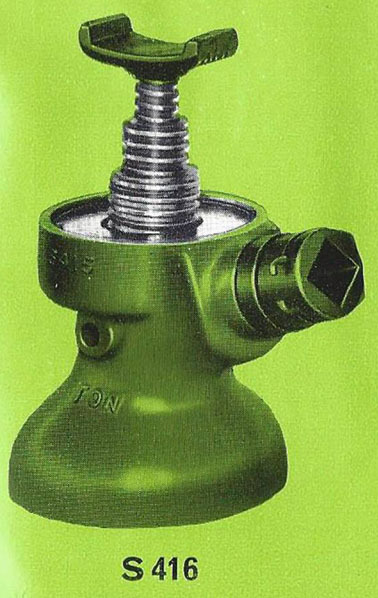 The S792 is a double screw jack. 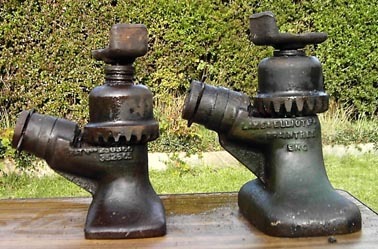 It is cast LAKE & ELLIOT LTD MADE IN ENGLAND on one side and MIDAS DL S792 on the other. No other details known other than shown in the photos. Single piece bar, probably 30" long with wooden handle. 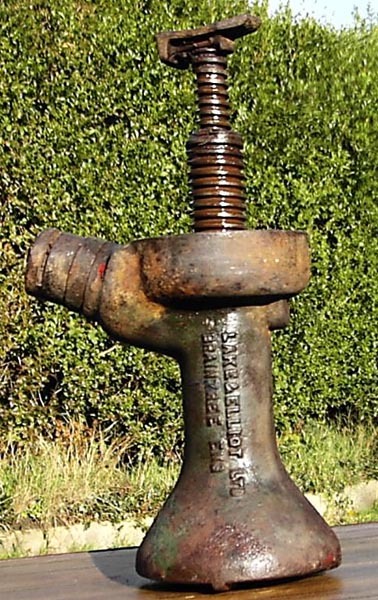 The V821 is a 2 ton single screw jack. 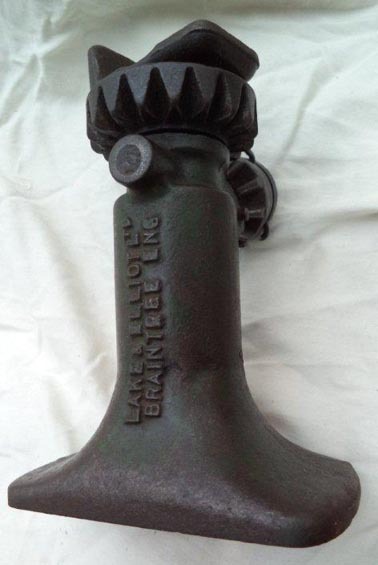 Cast with LAKE & ELLIOT BRAINTREE LTD on one side and V821 on the other. 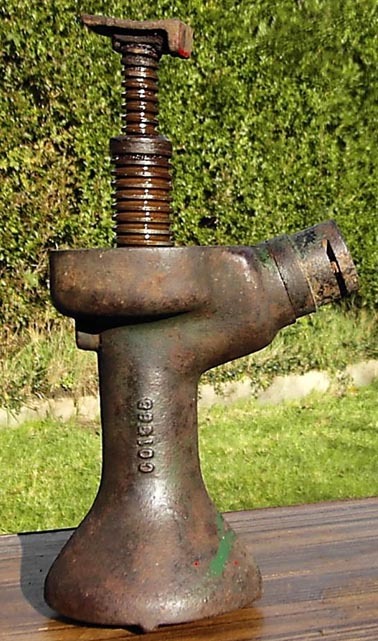 The V821B is a 2 ton single screw jack. Cast with the identification S405 or V821B, it is listed in catalogues as the S405 (most confusing!). It is 9.5" closed and has a 6 3/8 screw extension. Extended height is 15 7/8". See S405. The S903 is is a 2 stage jack. 5 1/4" closed. It is cast R903 down one side. 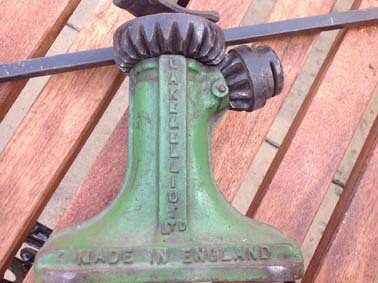 LAKE & ELLIOT LTD BRAINTREE is stamped on the horizontal flat circular plate of the winder mechanism. As shown in 1st and 2nd photos. 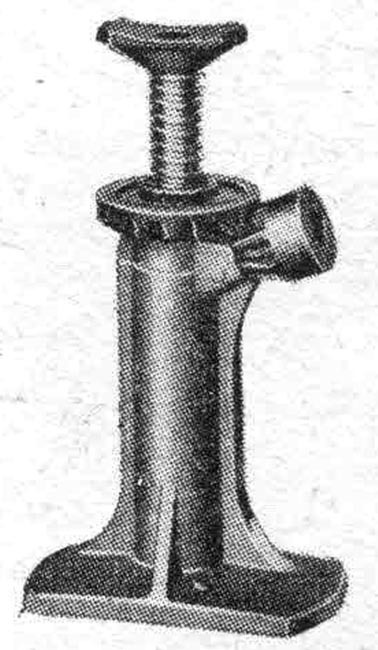 The single length round bar handle, engaging in a 'starter handle' type winder hole. The S940 is 6" closed and 10" open. All other information as shown in the photo. As shown in 4th and 5th photos. The single length handle is 24" long. The jack is a single stage, cast LAKE & ELLIOT G951M. It is 11 inches fully extended. 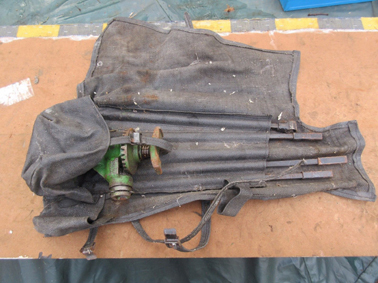 The S1007 is a 35cwt double screw jack. 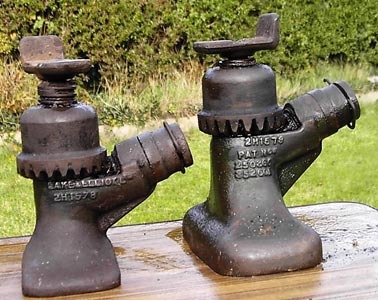 It is cast S1007 35 CWT on one side and LAKE & ELLIOT LTD MADE IN ENGLAND on the other. The top of the crown wheel is stamped 132622. It is 7" down and 16.5" fully extended. The unusual design of the winder accepts a 1/2" square bar or the starter handle. Photos and details courtesy of Joe Robbins. The unusual design of the winder accepts a 1/2" square bar or the starter handle. 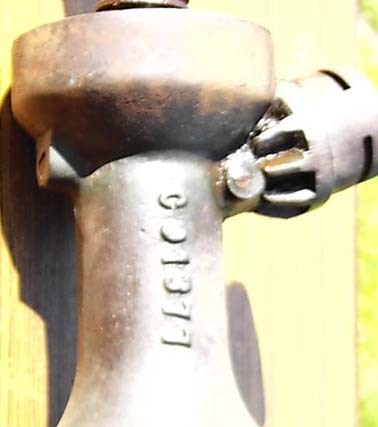 This jack is a twin screw, cast with LAKE & ELLIOT on one side and S1028 2 TON on the other. First 3 photos courtesy of George Radion in Australia. Final picture showing the jack extension to 17 inches courtesy of Andy Plummer. Ford Transit Mk1. Apparently appears in owner's manual. Jack and handle wrap last photo. Two or more piece bar with wooden or metal cross piece. 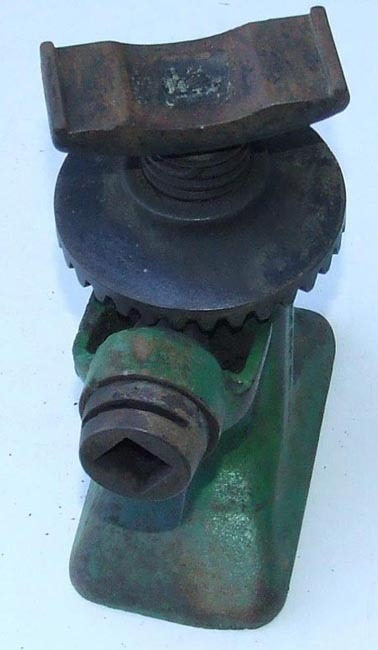 Triple screw jack. Cast L & E LTD on one side and CO1604 on the other. On the top is cast SAFETY FIRST LAKE & ELLIOT LTD BRAINTREE ENGLAND PUT ON HAND BRAKE BEFORE JACKING. Some similarity to the S416 casting except for the position for the round lug on the body below the winding mechanism. Photos and information courtesy of George Radion. 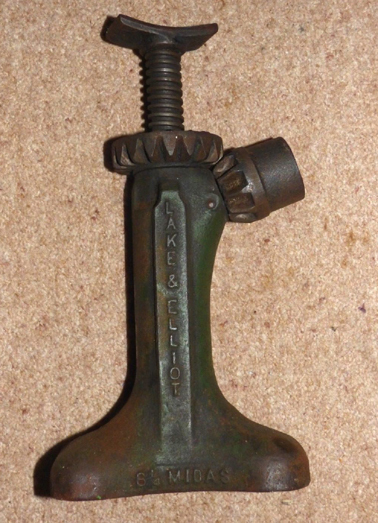 This jack is a twin screw, cast with LAKE & ELLIOT LTD BRAINTREE ENG on one side and CO1377 on the other. The jack is 7" closed. The saddle on this one has been reattached inverted! Photos courtesy of NewMoody. As shown in final picture. 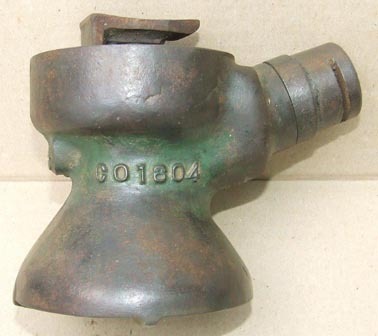 This jack is a twin screw, cast with LAKE & ELLIOT LTD BRAINTREE ENG on one side and CO1388 on the other. The jack is 7" closed. The saddle on this one has been reattached inverted! Photos courtesy of NewMoody. The 2H1577 is a double screw jack measuring 6 1/8" closed and 14 1/8" extended. See attached document for precise jack and handle measurements: Measurements . Photos, description and measurements courtesy of Ken Fields. 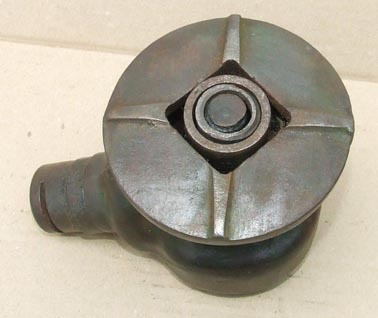 Supplied with or bought as an after market jack for an Austin Ruby. 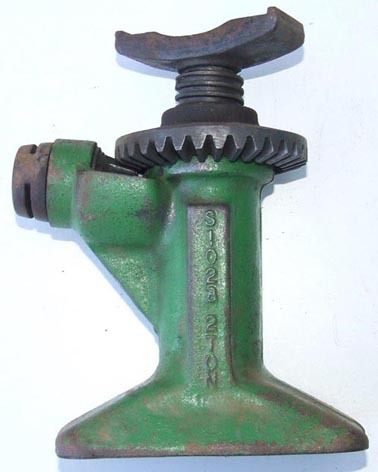 Twin screw dome headed jack. Cast LAKE & ELLIOT LTD 2H1578 on one side and PAT Nos. 250366 352605 on the other. It measures 5.25" closed and 13" extended. The base measures 5" x 3". The second photo shows the comparative size of the 2H1579 on the right. Photo and information courtesy of NewMoody. 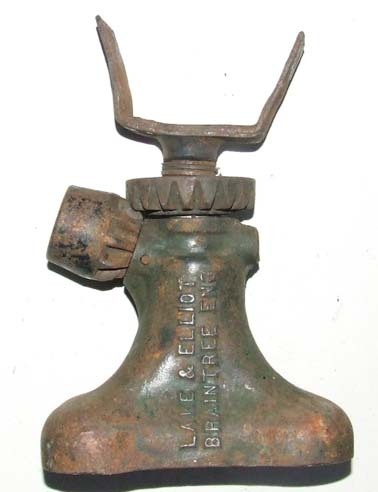 One vendor believes this jack was supplied with the Austin 7 and Ruby. More details required please. Two section with wooden handle. 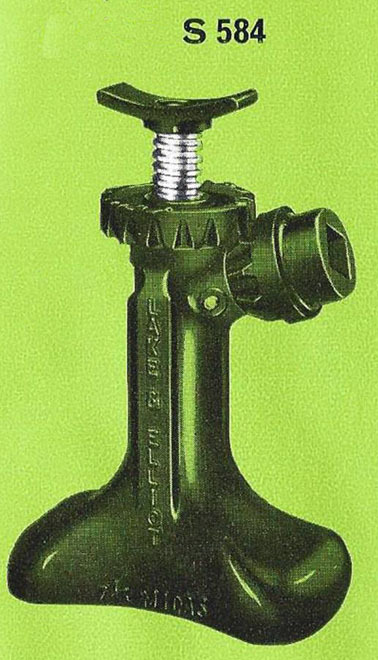 Twin screw dome headed jack. Cast LAKE & ELLIOT LTD BRAINTREE ENG on one side and 2H1579 PAT Nos. 250366 352605 on the other. It measures 6.25" closed. The base measures 6" x 3". The third photo shows the comparative size of the 2H1578 on the left. Photos and information courtesy of NewMoody. 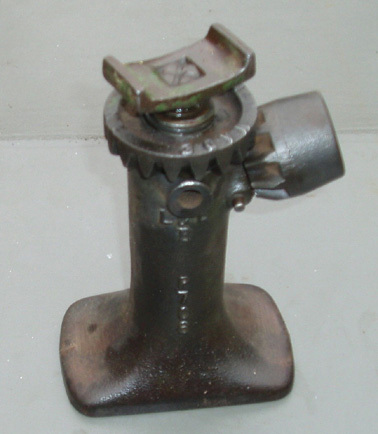 This is a 2 stage screw jack. On one side is cast N17080 and on the other LAKE & ELLIOT LTD BRAINTREE ENGLAND. 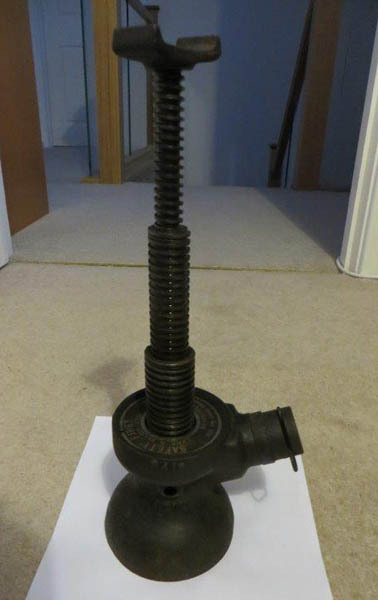 On top of the winding bevel gear is FABRIQUE EN ANGLETERRE suggesting that this jack may be for a French Vehicle. It is 8.25" closed. 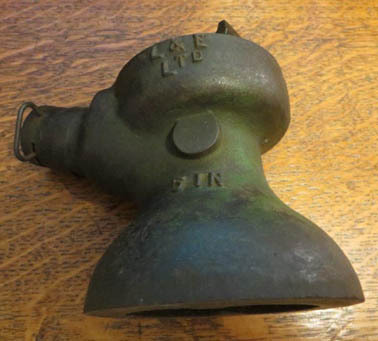 Information that has come to light says that N17080 is a Ford stock number for Fordson jacking systems, Photos and data courtesy of NewMoody. 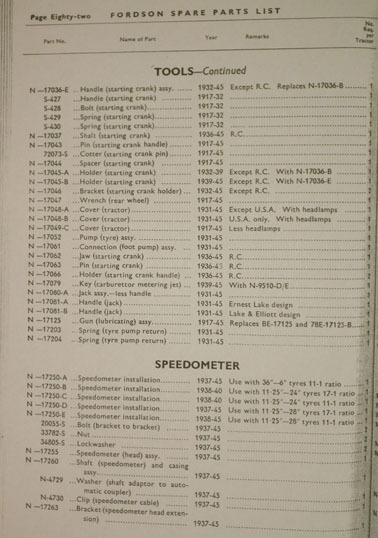 Fordson parts catalogue extract courtesy of John Hawking. Fordson tractors built between 1931 and 1945. 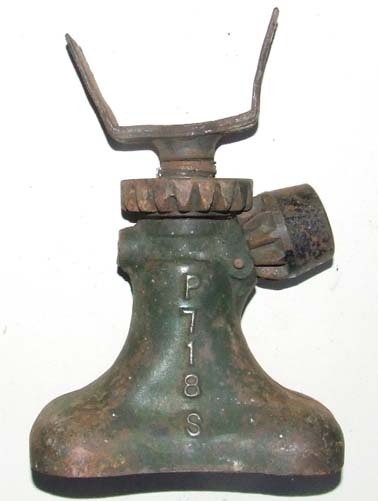 The EC/1790 is a military jack from the WW2 era. 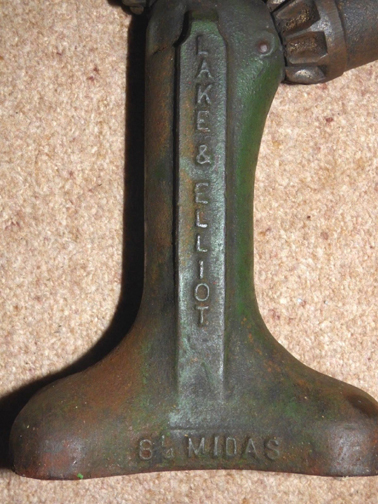 It is cast LAKE & ELLIOT LTD EC/1790 No.1 MK.1. BRAINTREE ENGLAND 1944 5 TON. It is 60cm closed. 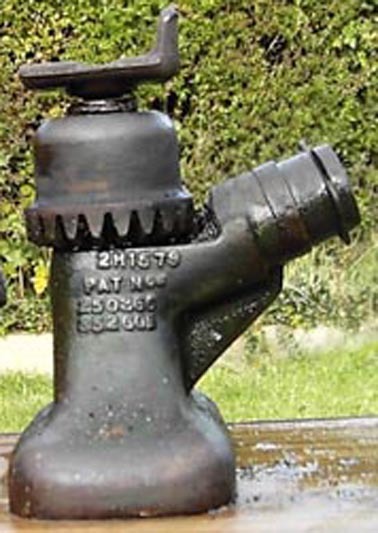 It is identical to a Britool 5 Ton jack. 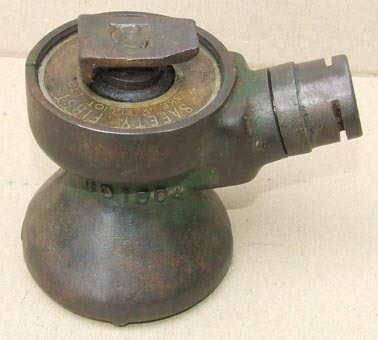 Another example has come to light cast C 0790 and also dated 1944. Information courtesy MenMoody. 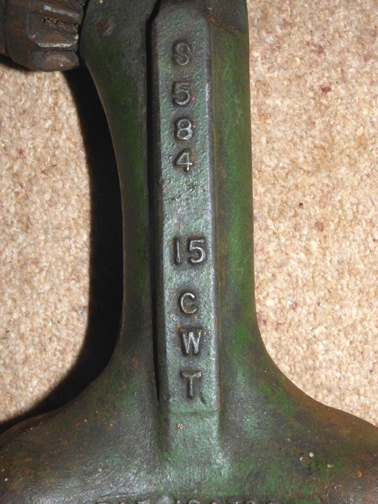 This jack was probably used by light armoured vehicles or staff cars in the BEF campaign in France 1940. 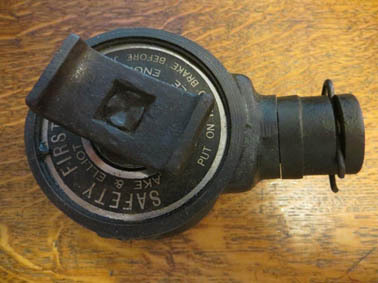 An example was found among abandoned vehicles during the Dunkirk evacuation (last photo). 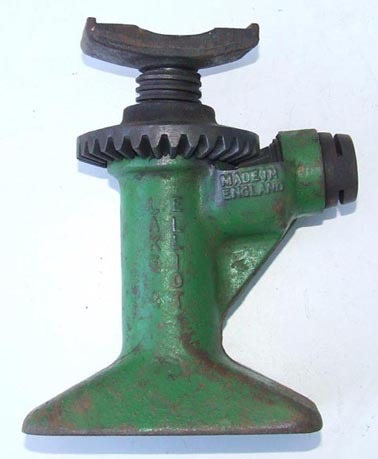 Twin screw dome headed jack. 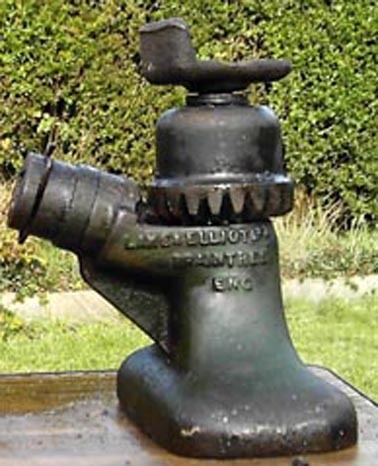 Cast LAKE & ELLIOT LTD on one side and the crown plus A.M. 1936 (or 1937) 2TON PAT No. 250388 on the other. 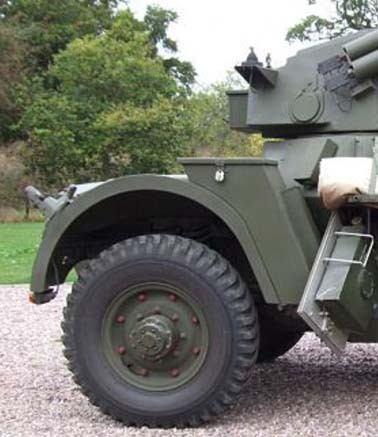 Light armoured vehicles or staff cars. Cast with LAKE & ELLIOT. It measures 7" closed and 11.25" open. For lifting 10 -12.5cwt.